Tornado outbreak tracking | Watts Up With That? 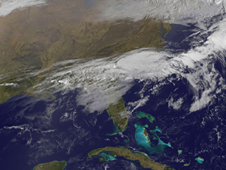 A satellite animation of NOAA’s GOES-13 satellite imagery showed the movement of the front that triggered severe storms and tornadoes in several states on February 29, 2012. 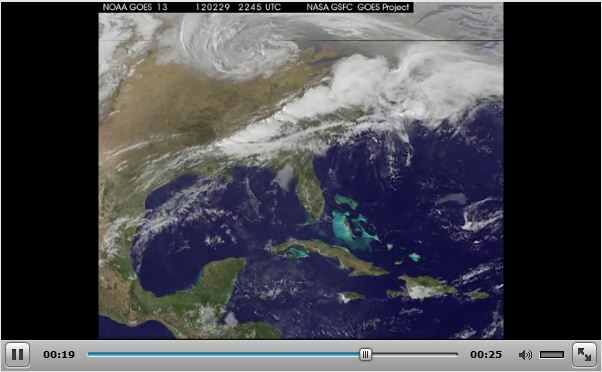 Today, NASA released a GOES satellite animation of that weather system that triggered at least 20 tornadoes. 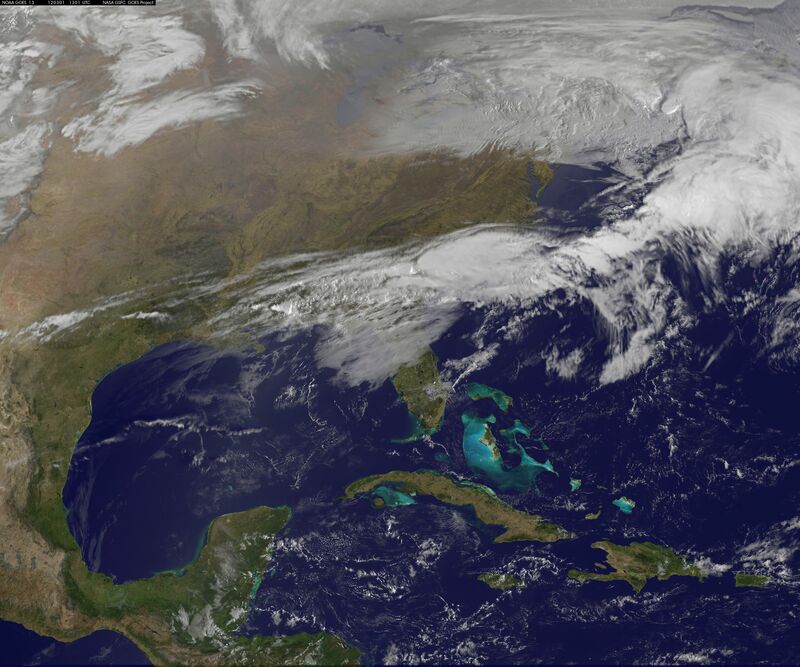 NOAA’s Geostationary Operational Environmental Satellite, GOES-13, captures visible and infrared images of weather over the eastern U.S. every 15 minutes. NOAA operates the GOES series of satellites, and NASA’s GOES Project, located at NASA’s Goddard Space Flight Center in Greenbelt, Md. compiles the images into animations. The GOES visible and infrared data is compiled and then overlayed on a true-color land surface map of the U.S. that was created using data from the Moderate Resolution Imaging Spectroradiometer instrument that flies on NASA’s Aqua and Terra satellites. Tornadoes on February 29 raked through Kansas, Nebraska, Illinois, Indiana, Missouri, Kentucky and Tennessee. The severe storms killed at least 12 people. Tornadoes also touched down in the well-known tourist destination of Branson, Missouri, famous for country music theaters. USA Today reported that up to six of the city’s 40 theaters were damaged. NOAA’s Storm Prediction Center reported that tornadoes killed 550 people in the U.S. in 2011. The cold front associated with the storms that triggered tornadoes on February 29 is over the southeastern and Mid-Atlantic U.S. today, March 1. Another cold front is moving into the areas that experienced severe weather yesterday, and the National Weather Service noted that the south-central U.S. could experience more severe weather today. NOAA’s Storm Prediction Center forecasts a moderate chance for severe weather in southwestern Ohio, southeastern Indiana, central Tennessee, and northern Mississippi and northern Alabama. A slight risk of severe weather is forecast in 15 states today, March 1. Thunderstorms are expected from southern New England, through the Ohio and Tennessee Valleys, and as far west as eastern Texas and Missouri today. For those interested in tracking storms yourself, you can download a free and functional trial copy of StormPredator personal weather radar software. Thanks for finding this Anthony. You be sure it will be on my weather telecasts today. I read that the new technology provided an additional 30 minutes warning of the tornado that hit Branson MO this week. All I know is their “Tornado Warning” for our county failed miserably last night. We had a nice, gentle rain with no winds at all last night. Rainfall total was less than 1″. I live in SE Missouri, Poplar Bluff for all you fans out there. Had to get up at 4:30 AM and head to the basement. One of those tornadoes was spotted about 5 miles SE of here. Of course they are pretty hard to see two hours before sunrise. The GOES video makes it look like it all happened in daylight. Fortunately for us there was no serious damage locally. I’d hate to be around if a Joplin or Tuscaloosa 2011 twister hit at such a sleepy hour. I suppose I’d hate to be around one of those at anytime, come to think of it. Researchers based in the U.S., U.K., Netherlands, Germany and Spain contributed to the study, which was funded by the U.S. National Science Foundation. Speaking of Storm Predator, I purchased it way back before Window 7. Is there a way that I can retrieve my activation key with out re-buying the program? I still have my original E-mail addresses. Tornadoes: day by month are shown at the link below. The text is a “must read” – otherwise it is difficult to know what you are looking at. 3. The warm, moist air influx that provides the ‘fuel’? And what amount of ‘boost’ would you attribute to ” Lunar declinational tidal effect” in this event? An audible alarm for severe weather might be a selling point, Anthony. We’re heading into the “mean” season. Posts by: _Jim, need to be taken seriously. _Jim, that link talks about the new technology and the advantages. I’ve seen video showing the the dual-pol radar images from the night of the Branson tornado and it shows the debris field around the tornado alerting forecasters to the fact that it was indeed a tornado on the ground. Reply; the reoccur-ant position of the jet stream and the upper level low is the result of the Lunar declinational bulge being almost the same as it was the past three cycles when the lunar declination was the same, they are the product of the cyclic timing of the tidal bulge production. the only thing different from the past three cycles is the addition of the heliocentric conjunction of Mars on the 3rd of March this year, increasing the volume of the tidal pulse a little more than the past cycles. Reply; The cold front is a combination of the pulse of cold air coming out of Canada earlier and the negative ion/static charge it carried on the leading edge, you can see the ions pushing ahead of the cold air in the water vapor satellite series. 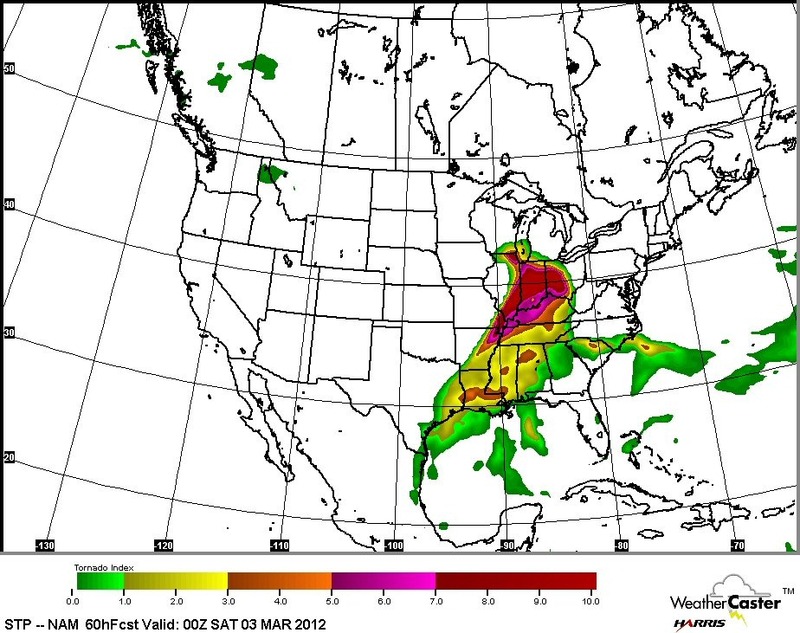 The cold alone will not generate tornadoes it requires the ion gradient as well to trigger the intense vortex action. “”3. The warm, moist air influx that provides the ‘fuel’? Because of the positive ion charge the lower air swirls up into the negative charge area just ahead of the cold front that helps push it up, results in the generation of the vorticity. “”And what amount of ‘boost’ would you attribute to ” Lunar declinational tidal effect” in this event? Reply; The timing of the concurrence of all of these forces is the result of the ionic and tidal effects of the Moon being maximum North at the same time the polarity of the solar wind shifts from its peak charging cycle. Tornadoes form from the cresting of the tidal and ionic strengths, just as the magneto on your lawn mower sets up the charge for the discharge through the spark plug just past top dead center of the piston travel. I would be glad to answer any further questions you have, much of what I would tell you can be found at the above links. How do those theories fit in with the more generally-accepted concepts of of high pressure ridges and low pressure troughs, and Rosby Waves in general? Thanks Bill; not much ‘new’, but the NWS guy alludes to being able to see ‘debris’ with this option (we saw a good bit of debris from our KFWS WSR-88D last couple of years on several tornadoes, and I don’t think KFWS has been upgraded to dual-pol capability yet) … and I had not seen that ‘capability’ or feature in past white papers (on the subject) as the reason for the upgrade to dual-polarization, rather, the identification of various hydrometeors (hail vs heavy rain) which assist in the warnings for (obviously) hail rather than wait for ground reports by spotters as well as allowing the forecasters and meteorologists to gauge storm ‘health’ (or storm ‘life cycle’ as it relates to cyclogenesis) and strength and the way that tornadic formation storm can be seen to ‘skip’ ahead of an older cell which had already spawned a funnel (a dangling vortex) or tornado. BTW, significant upgrades have been occurring throughout the life of the WSR-88D; most of the digital and signal processing hardware (H/W) has been upgrade to COTS (commercial off-the-shelf) hardware vs the specially-designed H/W that was part of the original WSR-88D equipment ‘fielding’ a couple decades ago now. Do the NWS SPC (Storm Prediction Center) folks use this kind of information (‘the phase’ of the moon and planets) in creating their “Convective Outlooks” (ranging from today to as far ahead as 8 days), and if not why not? Can you cite any cases or storms on record where the posited theory regarding “Lunar declinational tidal effect” contra-indicated that severe weather outbreak? Would like to know of any ‘false positives’ indicated by the theory as well. PS Sorry for the typo on the misspelling of ‘Rossby’ in a previous post. Reply; The global circulation is driven by the Lunar declinational tides just as the ocean tides are driven. There are known periods and wave styles to the jet streams and the Rossby wave patterns, it is just nobody looked at the synchronization of them to the lunar declinational tides. I have spent almost 30 years just looking at the connections between the solar/lunar periods and global circulation patterns. “Please take however much time is necessary to understand. The discussion cannot advance until people make the effort to understand the basics. Bill, the document below might be of interest regarding the Dual-Polarization equipped/retrofitted WSR-88D NWS RADARs and the extended capability it offers the operational and warning meteorologists. The following pages contain information on various hydrometeors that can be identified using WSR-88D dual-polarization radar data. For each hydrometeor, likely values for Reflectivity and three key dual-polarization radar products are provided: Correlation Coefficient (CC), Differential Reflectivity (ZDR), and Specific Differential Phase (KDP). Descriptions for the three dual-polarization radar products are provided below to help you remember their significance in discriminating between various hydrometeors. 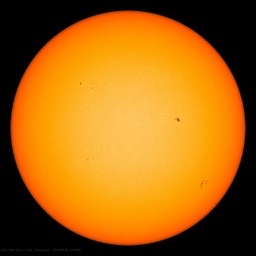 Reply; The forecast process I use, has not much to do with the “phases of the moon”, it is all about the solar/lunar connections with a focus on the solar wind and the magnetic rotation of the sun being in sync with the declinational movement of the moon because of the inductive forces of the changing polarity of the solar wind as the sun rotates, driving the declinational component of the moons orbital dynamics. then showing the resultant repeating patterns due to the Saros cycle of the inner planet returns. Piers Corbyn uses these same effects in his forecasting method ablate a little differently. As to why the NWS does not use this method, I gave up on trying to reach them 12 years ago, and started up this Aerology.com web site presence to reach the general public. Tornado debris detection Dual-polarization radar technology can also easily detect the presence of random shaped and sized targets like leaves, insulation or other debris, giving the forecaster a high degree of confidence that a damaging tornado is on the ground. This is especially helpful at nighttime when tornadoes are difficult to see with the human eye. That sounds like exactly what was shown on that CBS News video. >As to why the NWS does not use this method, I gave up on trying to reach them 12 years ago, and started up this Aerology.com web site presence to reach the general public. If your theory has any water publish it….or do a simple scale analysis, which will easily show that the magnitudes of the effects you claim are minimal to the point of being negligible. But the reason no one is listening to you is because the dynamics of severe local storms have been pretty well understood for a while now, and tornadoes can be simulated within a cloud-scale model that neglects all of things you claim are important. I gather you actually know virtually *NOTHING* about the dynamics of severe local storms given statements like ” negative static/ionic charges that gave added power to the temperature front to drive the condensation high enough to generate the tornadoes.” Ummm, NO! “Some aspects of climate science are known with virtual certainty” — some aspects of climate science are not known with certainty; and so on. With the standard method of forecasting with numerical models they hit the wall of accuracy at about 7 to 10 days out. Using my method I can forecast up to 18 years out with an average accuracy about equal to their 5 to 7 day forecast. In 1990 the comparison was about as good as the NWS 3 to 5 day forecast, in the past 22 years they have stretched their window of visibility out two to three more days. By adding what I and Piers Corbyn know and use, they could see the whole 18 year window as well. Bill, not a white paper (i.e. that is not a white paper on the subject); rather, it is much closer to ‘advertising lit'(erature) than anything else. I would also assert that the orientation of such RADAR reflective debris would be randomly positioned (remember is the longer dimension which provides the greater return (RCS or RADAR Cross Section) or reflection back to the RADAR site) or isa ble to be seen as a different Azimuth velocity as opposed to various shaped hydrometeors (e.g. raindrops which might be oblately shaped as in the case of large raindrops or more spherically shaped hail stones or small raindrops). Remember, simple horizontally polarized WSR-8D NEXRADs pick up debris ‘clouds’ as well. Let me be specific on this now: the implementation of Dual-Polarity as an add-on to the WSR-88Ds was not done for the purpose of debris-cloud detection; there are a number of sound meteorological reasons which the dual-polarity modes and equipment are being added, and a number of those modes optimize the WSR-88D for the purposes of detecting non-severe storm precipitation and also determining the type, although there appears to be a dedicated ‘spin’ afoot in the press (includes primarily TV it would seem) since “glitz and pizazz gets press”. Is it ‘budget time’ or something in NOAA/NWS land?.